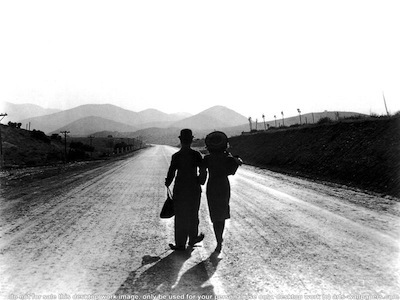 Charlie Chaplin's Modern Times is arguably the last great masterpiece of the silent era. Made in 1936, it was intended to be a full sound picture, but Chaplin decided to instead use sound as merely another comedic prop. The result is absolutely charming, effortlessly spanning the divide between two eras and never failing to generate a grin. The story of Modern Times begins with Chaplin's signature character, the Tramp, working in a steel factory. He is on the assembly line turning lug nuts. The monotony of the job and the inhuman treatment by his bosses is getting to him. The need for efficiency is superseding basic decency. In one of the film's funnier scenes, an inventor brings in a machine that will feed the workers so that they never have to pick up a utensil or wipe their own chins. Naturally, this doesn't work properly, and though the Tramp is strapped into the malfunctioning contraption, the men pay him no mind as they keep trying to get their device to work. It's all about progress, who cares if the little man keeps getting pie in his face? The elaborate sets and effects in the factory scenes are amazing. Most famously, there is a bit where Chaplin falls into the cogs and wheels and is cycled through, just another piece of the machine. It's this event that causes the Tramp to have a breakdown, getting him out of the factory and onto the series of unfortunate events that will make up the rest of Modern Times. It's an episodic story, the Tramp tumbling from one spot of trouble to the next. After a stay in the sanitarium, he accidentally happens into a Communist march and gets arrested; in jail, he foils a jailbreak and gets released; and so on. Along the way, he also runs into a young girl, billed as "the gamine," played by Paulette Goddard. Her father was killed in some kind of demonstration by unemployed men, her sisters were taken by social services, and she is all alone. The Tramp helps her, and they try to make a life together, getting a series of jobs and dodging the police where they can. 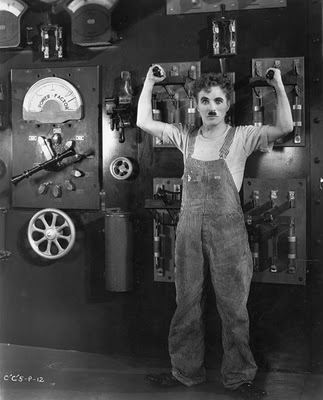 Charlie Chaplin, who wrote the music, scripted, produced, and directed Modern Times in addition to starring, has an uncanny knack for social satire. The events in the movie showcase situational comedy at its most basic: whatever the Tramp stumbles into leads to laughs. Given the theme of the picture, the things he stumbles into have something to do with life in 1936. At a time when many were out of work and going to bed hungry, the audience could identify with the Tramp. The fear that technology could eclipse the individual probably seemed like a very real prospect, and the introduction of assembly line worksites made it possible to manufacture more products at a faster rate, but at the cost of the personal touch. All of this is shown here, but it never edges out the pratfalls or Chaplin's ingenious visual gags. Perhaps it's because he doesn't physically say anything that allows Chaplin to say so much. Without dialogue, the Tramp can never make a speech or explain himself, and so he can never get preachy or otherwise let the message overtake his primary objective: laughter. There is spoken dialogue in the movie, but it's only ever heard via broadcast. The boss in the factory addresses his workers over a loudspeaker and an Orwellian television screen. Other information is heard on the radio. Technology has made communication a distant practice accessible to only those with the means--one of many aspects of this movie that still speaks to us today, as we grapple with an ever more complicated and alienating digital age (he says, ironically, writing his words about a state-of-the-art high-definition video disc on the internet). The only other synchronized sound is sound effects and, in the final reel, a couple of songs. 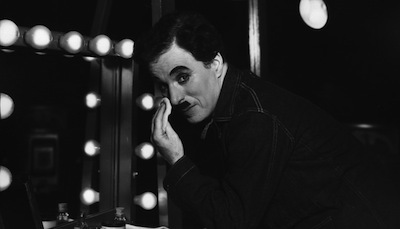 Most notably, Chaplin performs "Je cherche après Titine," a bawdy musical number that he sings as French gibberish. Listen carefully to the nonsense while watching his gestures, and the meaning is clear (we also get a peek at the English lyrics just before). The Tramp speaks, but he doesn't really say anything. His mystery stays intact. As does his unflapping optimism. The tone of Modern Times is "up." The Tramp and his gamine have a sweet rapport that borders on romance and gives each of them the strength to carry on even when things look bleak. Indeed, the final title card is "Buck up - never say die! We'll get along," and Chaplin can be seen mouthing the words "Smile!" Those familiar with the song will even notice strains of what would become "Smile" woven throughout the movie. (Lyrics wouldn't be added until 1954; though Chaplin never performed it, due to the tune's origins, it's usually associated with him.) The Tramp never despairs, never gives in, and despite his bending the law from time to time, he always tries to do what is fundamentally right. It's no wonder that he was such an enduring and popular character throughout the era. I know a lot of people who have never seen a silent film. The perception of these old movies is that they are antiquated and, worse, boring. How could they be interesting if no one ever says anything? Naturally, those of us who watch silent movies know how wrong this is. Modern Times would be a good start for anyone who hasn't tried silent comedy before. It bridges the gap enough that it has a curiosity factor going for it, and the impressive sets and camerawork should prove both impressive and surprising. Even better, the comedy in Modern Times is as novel and hilarious as you're likely to find in any contemporary films. Chaplin always intended his routines to have universal appeal so that his movies could be watched all around the world. That worked out. Borders could not hold him back. It turns out, neither could time. Modern Times is a comedy that knows no age. Recently, I've watched a bunch of the Warner Bros. Chaplin discs that came out years ago, and though most of them looked pretty good, there were definitely some problems, including fuzzy resolution and print damage. With this in mind, I am all the more amazed by the high-definition, 1.33:1 image on the Modern Times Blu-Ray. There is nary a hint of dirt or digital noise, and the overall picture is clear and beautifully rendered. Darks and lights are contrasted well, and the surface grain on the image gives it the right kind of vintage polish. This is an extraordinary restoration. 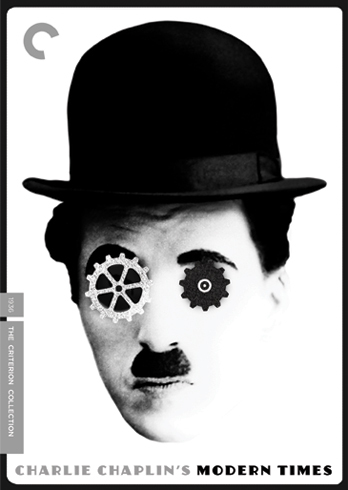 The Criterion release of Modern Times, Charlie Chaplin's final performance as the Tramp, is about as modern as it gets. This is the way to take a film from 1936 and release it in a 21st-century format! The fantastic restoration job means we can enjoy every frame of Chaplin's upbeat social critique. And are there lessons to be learned for us all these years later? Are we still struggling with the place of the common man in a technological world, still wrestling with unemployment and worker's rights? You bet. 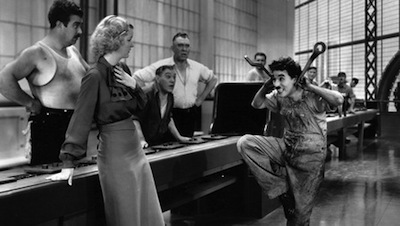 Thankfully, we also still know how to laugh, and so Modern Times still manages to pack its punch. If you're ever feeling pessimistic about what tomorrow holds, just put Modern Times in your Blu-Ray player, and you're sure to smile.